Lenni Lenape word for “swamp”) and overseeing the world’s toughest highway exit at the Garden State Parkway and West Chestnut Street. down to 12 m.p.h., while traversing rough pavement and loose gravel, making a sharp right turn of 330 degrees, descending 30 feet to the underpass below, as 3 or 4 rush hour maniacs cling to your rear bumper. In winter and in rainstorms, the maneuver is exacerbated by water, slush, sand, and highway salt. You have approximately 10 milliseconds to view the World’s Tallest Water Sphere from this vantage point. 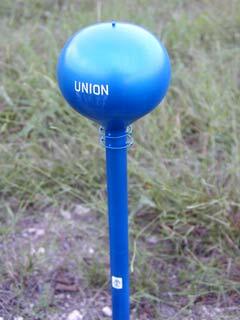 Despite the lack of visitor ammenities, toilet facilities, tram or shuttle car arrangements, Kodak sponsored Photo Spots ™ , or plush mascots, the World’s Tallest Water Sphere is admired by millions of New Jersayans and particularly by the hundreds of thousands who have called Union Township home. At the World’s Tallest Water Sphere Museum in Austin, Texas, visitors may arrange to view this nearly 14 inch (35 cm) tall styrene plastic model of the water tower. The tower is constructed from two HO scale “Modern Water Tower” model kits from Walther’s Model Railroading Cornerstone Series. 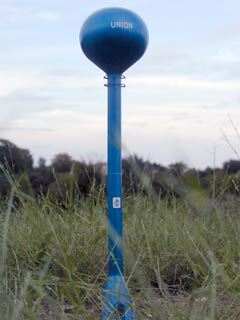 While the stock kit water tower is a puny 9.5 inches (24 cm) tall, the author has taken two kits, and surgically cut and spliced them together to achieve the graceful towering dimensions of Union Township’s World’s Tallest Water Sphere. It’s hard to believe, but this is an over 47% improvement over the height of the original model kit. The model is assembled with Testor’s Liquid Plastic Cement, primed with Krylon Gray Primer, painted with Tamiya Light Blue Metallic (TS-54), and protected with a coat of Krylon Matte Sealer. 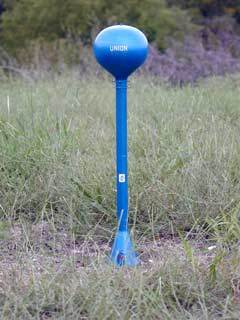 Other custom features of the model include the two futuristic circular antennae beneath the base of the sphere (constructed with brass wire), the Gothic white “Union” lettering (dry transfer decals), and the all-important “water pump” logo one third of the way up the shaft of the tower (hand painted with acrylics). Some interpret this emblem as a water pump, but others have claimed it is an early iconic representation of the symbol used by the artist Prince during his turbulent days as a slave an employee of Sony Music. 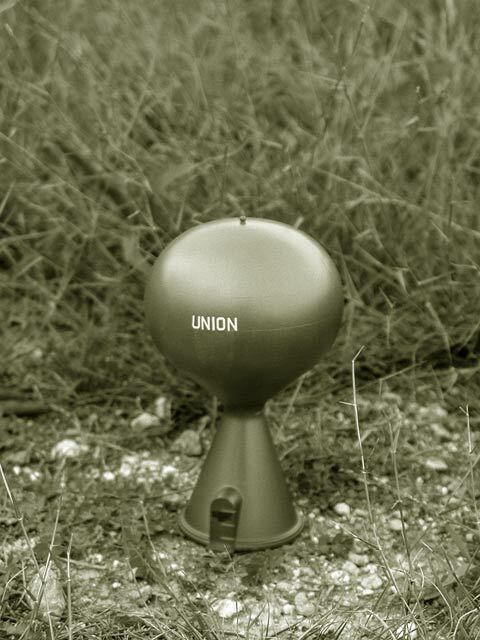 Another important feature of the tower is the “weeping paint” used to make the six foot (2m) tall letters of the word Union. Some have claimed to see the image of Jesus Christ weeping for the travellers of the crowded Garden State Parkway. Others claim it is the cheap white latex paint. To date no scientific tests have supported either theory. pressurized water blaster which could shoot water up to 30 feet, recommended for ages 4 and up, perhaps with a shoulder strap and authentic purple and green Hulk styling. It was not until the mid 19th century that the first water sphere was constructed in Union Township. Shown here in its unveiling, the township residents laughed at its paltry height and petitioned the five members of the Township Committee, elected at-large for staggered three-year terms, for a taller water sphere, one that would command the respect of the entire world. The tall tower was such as success that eventually all of New Jersey’s important highways would pass within 1 mile of the tower. Today the tower provides millions of impressions each day. Motorists who see the tower are inspired by its majestic stature and artistic beauty. This entry was posted on Friday, October 21st, 2005 at 1:55 pm	and is filed under History. You can follow any responses to this entry through the RSS 2.0 feed. Both comments and pings are currently closed.